We are excited to announce that Split An Atom was ranked, again, for a third year running, as a top firm in the UK on Clutch. Split An Atom is an integrated marketing agency. Some of the services we specialize in include content marketing, public relations, and web design. 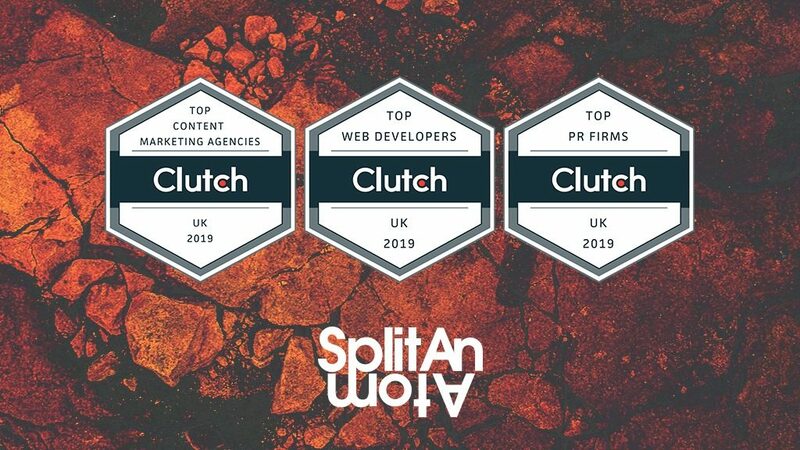 We are thrilled that our Clutch profile has warranted us to be ranked high on this year’s Clutch top public relations companies in the UK, a top content marketing agency in the UK, and a top web developer in the UK, winning us three more awards for our trophy cabinet. In addition to our feature on Clutch, we were also featured on their sister-site, The Manifest. This site highlights Split An Atom as one of the top 100 PR firms in the world! The web is at the heart of almost all of the strategies of our clients, so our web development services have always been a key part of what we do, focusing on bringing complex web applications and appealing marketing pages to an increasingly mobile-first world. Our content marketing services go hand-in-hand with the web as more people than ever before are connected across the world. The future of public relations, while once thought to be in flux, is now more important than ever. As image crafters and storytellers, it is imperative to have a story that speaks to audiences. With the demand for fresh content, we have offered both marketing and public relations services to more perfectly align with our clients’ needs. At Split an Atom, we are thrilled that our Clutch profile reflects our client’s positive experiences about our services. We are confident that our team will continue to serve clients and expand their businesses. 2019 is off to a positive start, building on our success and awards of previous years. I would like to take this opportunity to personally thank our team and clients for making us a Clutch UK Leader for the third year in a row. It’s truly humbling to have our work acknowledged once again, and I appreciate all the hard work that colleagues and clients alike put into the work we produce. I am very excited for the year ahead with you all.